As a daughter of Taiwanese immigrants, I grew up loving the taste of fresh soymilk. Fresh soymilk is such a staple in a traditional Taiwanese breakfast, where it is often enjoyed hot with a deep fried culler (you tiao) and a sesame flatbread (shao bing). When I was a kid, my mom used to make fresh soybean milk at home. The process was laborious. First, you soak soybeans in waer overnight. Then you steam the soy beans, blend them (in small batches), squeeze out the milk with a cheesecloth, and then slowly cook the entire mixture again over low heat. The process would take all day, but the results were delicious. More recently, my mom told me that my uncle (who is vegan) now makes soymilk at home using his Vitamix blender. Since I have a Blenctec blender at home, I decided to try it myself. I don’t think I’m ever going to buy soymilk at the market again. Not only is this stuff delicious, it only costs a few cents to make (even organic soy beans are pretty cheap), and I can make it anytime I crave soy milk. First of all, I do want to clarify that the soymilk that comes out of the Blendtec tastes like fresh, Asian soymilk. It has the full glory of the soy bean taste, which I love, but which some people may find to be too strong. This does not taste like Silk vanilla flavored soymilk. Instead, it tastes more like the thick, creamy stuff you can buy in Chinatown. I think it’s absolutely delicious. First, it’s crucial that you soak the beans, preferably overnight. Next, you must cook them. I usually steam the beans for about 45 minutes on the stovetop, which works pretty well. Once the beans are cooked, fill up your blender (in batches, if necessary), with a ratio of 2:1 (water:beans). I’ve been using the whole juice setting on the Blendtec, which essentially pulverizes the beans and forms this thick, creamy milk that’s chock full of protein and fiber. I think the smoothie setting works fine as well. Some people are perfectly happy to drink the soymilk in this raw form. The texture is slightly thick and a bit gritty, so it’s more of an acquired taste. If you like a smoother soy milk (like the ones in the supermarkets), as a last step you can filter this thick liquid through a cheese cloth. This removes the thick, fibrous part of the bean and results in a fresh, velvety, silk-like texture. Optionally add sugar and enjoy! You can enjoy it hot with you tiao (Chinese fried crullers), or chilled and sweetened as a beverage. Soak the beans in water overnight. Make sure the beans are well covered by the water, since they will expand quite a bit. Drain the water and steam the beans for about 45 minutes. Blend the beans and water (about 2:1 water:bean ratio by volume) on the “whole juice” or “smoothie” setting of the Blendtec (50-90 seconds, or until well pulverized). If a smooth soy milk is desired, filter through a cheesecloth. Optionally add sugar to taste. I’ve made this recently. None of the recipes that I have seen involve cooking the beans before pureeing. The recipes I saw involve soaking, pureeing, filtering and then boiling. Is that any reason for cooking the beans before pureeing? Now you saw :). I guess if you ever boil it first, your blender might last longer with soft ingredient, the nutrients might be extracted more easily and your pot won’t be burnt with the gain. And how interesting it is to drink soybeans immediately right after blending. I’ve wanted to make soymilk at home for so long now, but am wicked intimidated by it! I don’t have a Blendtec or a Vitamix (I have a kind of crappy Ninja) — do you think this would work in basically any food processor? I think the only reason for doing it this way is that you have the option of drinking the raw, unfiltered soy milk right after blending. 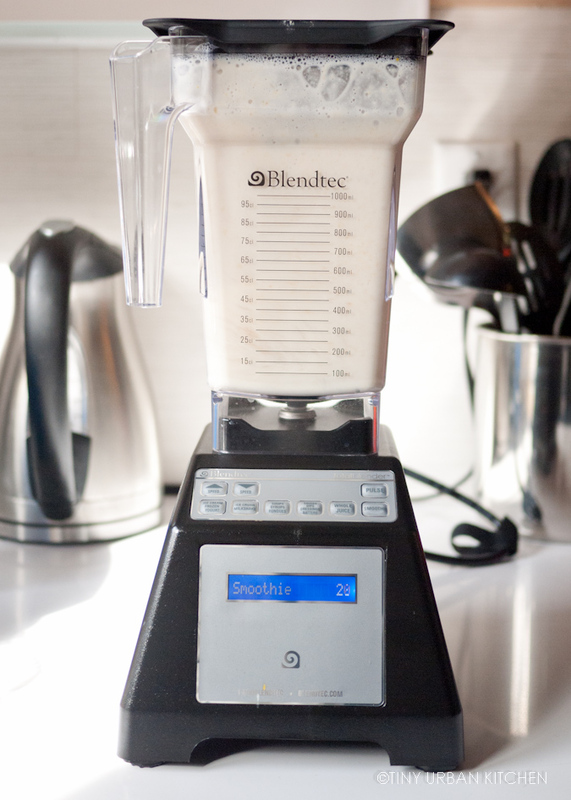 The Blendtec is strong enough that after blending you get this thick, creamy milk that doesn’t necessarily have to be filtered. I think it will work with a normal blender (that’s how my mom made it while I was growing up). You probably just have to filter it, since it will be even more gritty and less creamy! Do you know how long this would last in the fridge? Good question! I have definitely kept it for several days (maybe like 3-4?) without any problem. Typically I finish it by then!! One option is to make smaller batches (like 1/2 cup soy beans at a time). Another option is to freeze? Jen, I will have to ask your mom about this when I see her! I am so excited to try this! Keep up the great work.. I don’t know WHERE you find the time and energy to create this amazing blog! Thanks! I’ll give it a try. And maybe I’ll find I like gritty soy milk. Can we use other blender ? Cool! Great to know. Maybe this is the more “Western-friendly” version since it doesn’t taste as beany! Ha ha! You can also try boiling the beans (see commenter below who boiled), which might result in a mushier soy milk that is easier to blend? Not sure, but it’s worth trying! I wonder if boiling the beans also reduces the soy flavor compared to steaming it? So many variables!! Ha ha, YES! I remember watching my mom painstakingly squeeze the soy milk out!! Thanks so much JiaJia! I’m running on low sleep this week, ha ha! Yes you should be able to use a normal blender. You may end up with a thicker soy milk, which might need filtering! That’s funny that you say asian soy milk is thicker than western. I’ve found just the opposite -having always enjoyed the milk from chinatown because it was *thinner* and seemed to have been filtered, relative to western soy milk. So it had a more subtle flavor. Also, when I get hot soy milk with you tiao in China, I’ve almost never found particles in it. The consistency is much closer to broth than to porridge. Maybe it’s a Taiwan vs. mainland thing? Silk, by contrast, has this kind of sludginess to it … as if they were trying to maximize protein content, at the expense of smoothness. It seems much thicker than Asian soy milk to me. Ha ha, wait until you try the unfiltered stuff – it’s pretty thick! But I agree with you that the Asian one isn’t that thick. I guess maybe “beany-flavored” would have been a better descriptor? Cool to see the process. My mother-in-law (taiwanese) makes this at home, too. Unfortunately I discovered that it makes me violently, awfully ill immediately after drinking. Some sort of strong allergy, I guess. Is she boiling/simmering it after making it? My mom said that was the home cook’s way of pasteurizing raw soy milk, to kill any bacteria. This is great! Where can you get organic soy beans in the Cambridge/Boston area? Good question! I *think* I may have seen some at Harvest Coop in Central Square, but I’m not positive. I wouldn’t be surprised if Whole Foods had it. for me, I have to boil and simmer the milk for 15-20min before using it to break down enzymes. Many people cant handle drinking it straight. So thankful to have found you via Pinterest! Made soy milk tonight for the first time with my Vitamix and their instructions are awful so I was panicked and tried to find help on the internet to salvage the thick sludge it made. Now I have a creamy, drinkable milk and just had a mug of it with some homemade sugar-free pumpkin pie spice syrup (dietary restrictions)…so awesome! This thicker, creamier milk is so much better than the grocery store soy milks. Haven’t ever had a ‘real’ Asian soy milk to compare but next time I will follow your instructions from start to finish. Thank you! Would it work fine if I had cheesecloth/nut bags but i didn’t have a blendtec? I have a normal blender, and a ninja food processor/blender. This is cool! I’m allergic to soy, but I recipe that I really want to make requires a high protein vegan milk, it recommends soy… Do you think this would work with another type of bean? If so do you have any clue which bean would be the least bean tasting and the highest amount of protein? I also add unsweetened coconut in the blending and before straining. It adds a little fat and really makes it more creamy. Can we drink it raw I mean without steaming the beans n without boiling the milk. I have a Vitamix and I agree with you, the recipe instructions are awful, too simplified. I had to to do extensive research on the internet and eventually found this site. You need to filter the sludge either before or after boiling. Maybe try filtering it before boiling? If you don’t have a really powerful blender you’ll need to filter it. Hope this helps! Hi Jen. I was attracted by your side thanks to this recipe. Im a litle obsessed with taiwanese-oriental-chinese cooking. I have close friends from Taiwan as well, and I have to say they love their soymilk machine. My question is: afeter belnding, do I need to simmer the milk again? just like your mom did? If so, How many time do I need to simmer it? if I want to add it vanilla flavor or sugar, when is the best time to do it? before or after boiling? I hae never boiled it a second time. I would add the sugar at the end (after filtration). If you want to add sugar at this step, it might be easier to heat it. Hi — I found your site after going to so many the last few days. I started by making soy milk in my vitamix. I soaked the seeds, rinsed them and steamed them in my instant pot. I did not know what I was doing I guess — the instant pot is not a good way to steam them. I am so glad you have a photo of how to steam them using a covered wok! Then I blended them with water in the vitamix — for quite a while. I ended up with an absolutely delicious beverage. I have not liked the soymilk they sell at the grocery store but I’ve been looking for a vegan option to add to reheated coffee and I don’t care for almond breeze that way. Even though they had been steamed I still simmered them quite a while. In fact, with a machine as powerful as an Instant Pot I am wondering if the steaming process is necessary. My problem was trying to filter out solids. I had a lot of trouble because the solids were so fine [I think] they jut clogged up the filtering cloth. Eventually with a lot of squeezing force I had most of the solids separated, and made patties with that [added in some plain instant potatoes, a bit of oil, a little liquid, and a bit of hoisen sauce. I fried them for lunch [they were tasty]. what I want to know is if the steaming is really necessary if I am going to simmer whole bean soy milk afterwards. My plan is to use some of the soy milk to make tofu [I have calcium sulfate for that in my cupboard]. do I need to filter out these very very fine solids [the soy milk is very smooth] or can I leave them in when I make the tofu. I hope someone sees this and has an answer for me. re from Toby Fouks — there’s an error — I meant with a machine as powerful as a Vitamix [not Instant Pot]. sorry! It’s easier to simmer after you’ve filtered out the solids. As a kid, my mom would pour the blended sludge into a rice bag and it was my job to twist and squeeze like crazy till all the soy milk ran through the cloth to the pot below. It takes some strength. What you’re left with in the bag is some thick stuff that’s a little like Play-Doh, which my mom would then let me play with.